Alton QB Drew Jones completed 6 of 8 passes for 123 yards and two TDs — all in the first half — in the Redbirds 45-9 victory over Granite City on Friday night in Alton. The Redbirds led 45-3 at halftime. 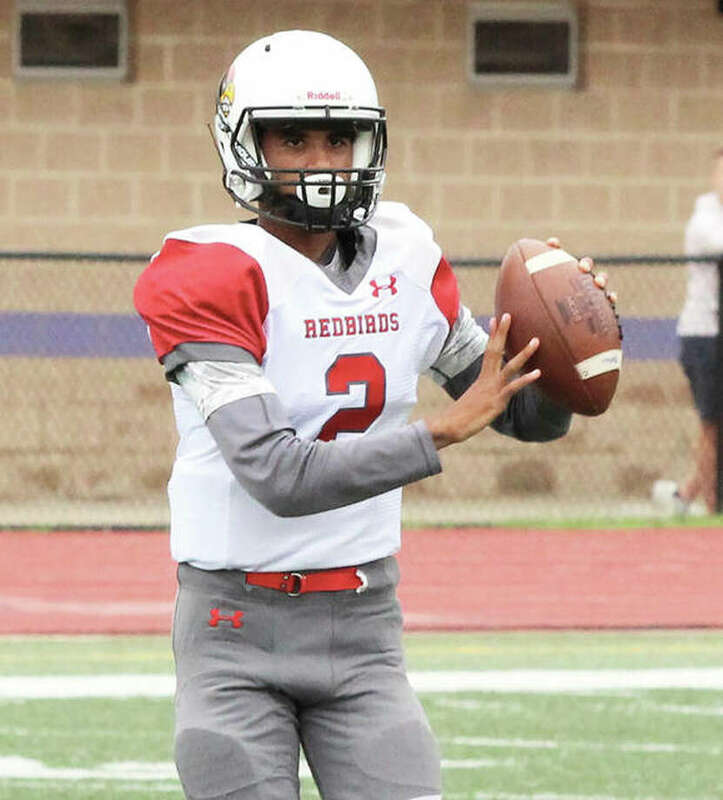 ALTON – The Alton Redbirds produced three touchdowns from their first nine offensive plays to stagger the Granite City Warriors on Friday night. The Redbirds defense then landed a knockout punch with linebacker Terry Walker’s interception and 30-yard return for another TD. The Redbirds’ 28-0 lead less than 10 minutes into the first quarter grew to 45-3 by halftime and Alton finished off the Warriors 45-9 under a running clock in the second half at Public School Stadium. With the fifth win needed to become playoff eligible at stake for both teams, the Redbirds overwhelmed the Warriors to improve to 5-3 with East St. Louis visiting Alton next week. Granite City takes a 4-4 record to Galesburg. The Warriors came in averaging 276 yards rushing and 37.4 points per game, but were stuffed by the Redbirds defense. Granite finished with 24 rushing yards on 30 carries. By halftime when the outcome was decided, the Warriors had run 29 plays for 26 yards. Granite was 0 of 8 through the air, while Alton amassed 360 yards offense in the first half. The Warriors’ only two first downs in the half came via penalty. Alton scored on its first play with Tim Johnson racing up the middle untouched for a 56-yard TD run. After another three-and-out for Granite, Johnson came back on the same play calls for a 43-yard gain and a 29-yard TD run to make it 14-0. Three Redbirds plays, 128 rushing yards for Johnson, who would finish with 194 yards and three TDs on 13 first-half carries. Alton quarterback Drew Jones completed 6 of 8 passes for 123 yards and TD throws of 7 yards to Walker and 4 yards to Lonnie Tate. Jones also connected on pass plays of 54 yards to Ahmad Sanders and 42 yards to Moory Woods. An 80-yard kick return by Jerry Watson set Granite up at the Alton 12-yard line after Walker’s pick six made it 28-0. And after Warriors quarterback Freddy Edwards ran for nine yards, he was thrown for a 9-yard loss, Watson lost 2 yards and Granite had to settle for a 31-yard field goal from Chase Reeves. But the Redbirds answered with two more TDs before getting the ball back again at their own 23 with 35 seconds left in the second quarter. Jones’ bomb to Sanders put Alton in the red zone and Jake Lombardi, who converted 6 of 6 PATs, drilled a 35-yard field goal on second down with 11 seconds left in the half to put the Redbirds up 45-3 and trigger the running clock that comes with a 40-point lead. The third quarter passed with just 12 plays and reserves settled the second half with no scoring until Granite backup QB Alex Bonvicino hit Justin Wiley for a 38-yard TD pass with 18 seconds left in the game. Edwards, who came in with more than 1,000 yards rushing and 1,000 yards passing, left the game after getting hit in the head early in the second quarter with Alton up 35-3. He would not return, but Hasquin expects him back next week. “We were already in a hole at that point,” Hasquin said of Edwards’ injury. “That didn’t make it any easier.